Draw reins run from the saddle billets where the girth attaches, through the ring of the bit and to the rider’s hand. This applies downward pressure to the bit when the rider applies a rein aid. 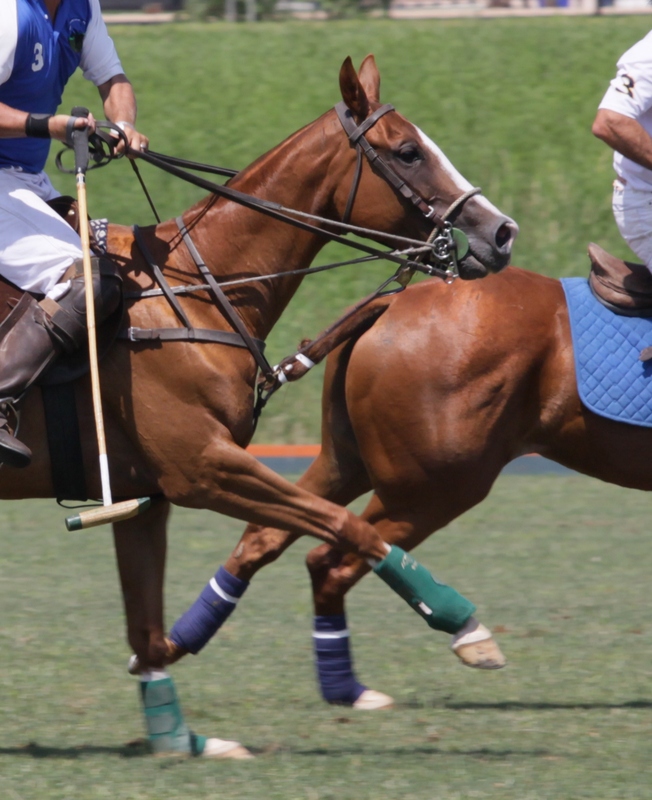 The majority of polo ponies will pick up the bad habit of inverting their back, throwing the head up in the air and bracing their mouth against the bit. This hollows out their back, forces their hind legs far out from under them, over-develops the muscles on the underside of the neck and is detrimental to joints and muscles. Stopping in this way is just like a kid, running flat out down a hill with no control, legs just barely keeping up enough to keep him upright. If not controlled, it’s dangerous and usually only ends one way. Stopping inverted is devastating on the back and a horse can only keep it up for so many seasons without feeling the strain from it. Additionally, repeatedly stopped inverted will over-develop incorrect muscles and will make it harder for the horse to relax and perform better. A lot of players will play every horse in draw reins but they can be overused. A horse that stops correctly will tuck his hind end underneath him, lift his forehand but keep his head and neck down and relaxed. A horse that overreacts to draw reins will begin to tuck his chin to his chest which is also not desirable. The horse’s forehead and nasal bone should never flex beyond the vertical.